Following a second Inters Team title and a near miss in Trucks, Team Ecosse will continue the fight in V8 Thunder's inaugural iRacing series. The team contains a mix of returning, current and new drivers and covers the whole spectrum with both proven and potential race winners and those that bring it home week in week out albeit slightly battered sometimes. As ever the team aims to keep up the spirit of fair play on the racetrack. A new signing for this season and a V8 rookie, Englishman James won his official iRacing Trucks division -8- in the season just finished. He made 82 starts and recorded pairs of wins at Michigan and Daytona together with 3 poles and 32 top 5s. He recorded just under 6 incs per race and finished the season with an iRating of 2098 and a D4.99 licence. Team Ecosse welcomes James and wishes the best of luck for the season. Thomas ran a limited season for Team Ecosse last time in V8 but bagged 2 Inters wins from 12 starts across the Inters and Trucks series. Thomas is Team Ecosse's winningest driver in the senior V8 series with 8 wins in total across Trucks, Inters and Trophy from 59 team starts. 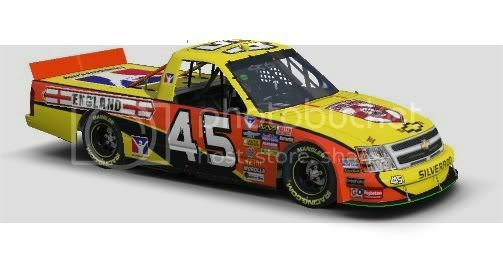 Thomas has run relatively few iRacing Trucks races so far but has registered wins at Bristol and Las Vegas. He recorded 1 incident per race and finished the season with an iRating of 2319 and an A4.99 licence. The Ecosse stock car team manager is a veteran of 246 V8 starts with 86 in Trucks but a win in that series still eludes him. With just 7 DNFs in those Trucks starts and low penalty points he is usually thereabouts in the standings come the end of the season. Steve has been dabbling with the Trucks on iRacing for a while and posted 25th of 233 in division 4. Steve registered 1 win at Daytona from 17 starts, recorded just under 3 incs per race and finished the season with an iRating of 2025 and an A4.57 licence. Norwegian Morten has made 114 starts in V8 Thunder including 22 in the Trucks series with a personal best of 5th at Milwaukee. Morten has been concentrating on the Impala and Impala B so far at iRacing but the chance to run again at V8 with team-mates has drawn him back to the Trucks. His best points finish so far has been 8th of 29 in the Impala B at Atlanta. Morten currently has an iRating of 1217 and a B2.95 licence.